Making deeper and more satisfying contact with your self and others is one of the many gifts of Gestalt Therapy. 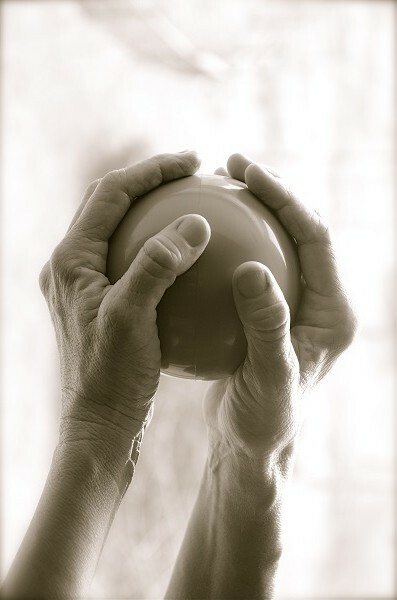 The way my hands surround and connect with this ball, in a close connection that strengthens my hands and allows the ball to have it’s fullness and it’s organic shape is a metaphor for satisfying contact. The work is an embodied and creative approach to healing and exploring one’s authenticity. The therapist and client work together as equals exploring what it means to be fully embodied and present in the here and now. Everything that happens in a Gestalt Therapy session is determined by the client’s sense of what is right for their organism. They are continually asked to go inside themselves to understand what they need. The goal of Gestalt Therapy is to enable individuals to listen more deeply and clearly to their authentic selves and to learn how to satisfy their needs enabling deeper contact with themselves and others. The client is always the authority in their work while the therapist acts as a guide who honors and supports the exploration of authenticity with respect and care. Knowing how to ask a question and what questions are valuable to begin a journey of self exploration is invaluable. Gestalt Therapy provides a foundation for ‘being with’ an individual in the present moment and to make and encourage authentic contact.